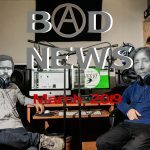 In this episode of The Final Straw, we’re playing a conversation recorded at the Paris Anarchist Book Faire about a month ago. I spoke with Sylvia and Mário, two anarchists from Lisbon, Portugal. Sylvia and Mário give a history of anarchism since the fascist dictatorship in 1926 under Antonio Salazar through 1974, when the government fell, and since. 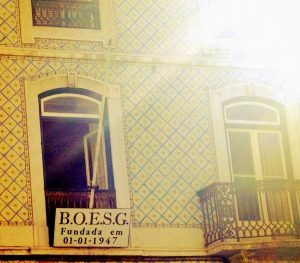 Sylvia and Mário are involved in a workers library founded during the dictatorship that was taken over by anarchists in the 1990’s and has continued, called B.O.E.S.G., or the Library and Obstacle Course Of the Global Society. B.O.E.S.G. also shares space with a bookstore and social center called Tortuga and sits atop a D.I.Y. music venue. For the hour, Sylvie and Mário talk about their experience of the social anarchist scene in Portugal, history, other spaces and movements around right now, publishing projects, gentrification of the city, the continuing economic crisis, institutional left political parties. The portions we cut from this broadcast conversation touch on Mário and Sylvias perspectives on sexism in the anarchist scene in Portugal, gender pronouns and on feminist organizing. The discussion shows a difference of cultural perspective and experience between languages as well as the personalities of those involved, but also the mental wrangling people do when methods of resistance are transplanted to new soil. Hopefully at some point in the future we can have a more in depth conversation on this topic. The reason we cut them from broadcast was constraints mostly on length of the time we have on the airwaves, but we’ve included it in the podcast version. I believe it’s through conversations like this that we can come to better understandings of where other peeps are coming from. Here’s a link for Map Journal that Sylvia talks about. alternative usage for the $1million dollars per year that Asheville Police Chief Tammy Hooper is proposing from the city budget. 5-7pm @ Pack Memorial Library . On May 19th, Firestorm will be presenting back to back showings of documentaries about anarchist urban guerrilla groups in the UK in the 60’s and 70’s. Starting at 6:30pm with “The Angry Brigade” and followed by “Persons Unknown” and narrated by Stuart Christie. Sunday May 24th at Firestorm, the Queer Linux Users Group, or QLUG, will host a discussion on device security at 3:30pm. Bring your device along. 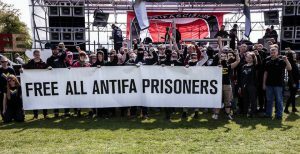 Annually on June 11th, people get together and offer solidarity to long term anarchist and ecological prisoners. I’d like to take a moment to mention a few. Marius Mason is scheduled to be in prison until 2030 for involvement in activities of the Earth Liberation Front and the Animal Liberation Front which hurt no animals or people but did $4 million dollars in damage through sabotage and arson. Marius is a trans man who came out inside of prison and uses his voice and renown to shed light on the plights of prisoners, including queer and trans prisoners. Other prisoners being organized around include Jeremy Hammond, the hacker who brought to light right wing spying on unions and back room deals around Dupont worming its way out of responsibility for the Bhopal Tragedy that still gives cancer to thousands in India. Also, Sean Swain, who’s segments you hear on this show. Then there’s the comrades suppressed in the Italian government’s Operation Scripta Manent, Alfredo, Nicola, Danilo, Valentina, Anna, Marco and Sandrone still being held in high security and with much mail censorship. Or Pola Roupa and Konstantina Athanasopoulou, members of Revolutionary Struggle in Greece, who have themselves and their families faced repression from the state and still staged solidarity with others in the fight. Solidarity can take many forms, from continuing the struggles comrades are ostensibly behind bars for, or sharing the information about the prisoners cases and organizing inside. It can be organizing your own discussions or groups to push against the carceral state or to send books to prisoners. On Sunday, June 11 at 6pm here in Asheville, the Odditorium at 1045 Haywood Rd, will be hosting an afternoon cookout sponsored by Blue Ridge Anarchist Black Cross, Smokey Mountain Eco Defense and Tranzmission Prison Project. Vegan and Gluten-Free options will be present, but bring food to share! There’ll be discussions on trans and queer prisoner realities, tons of free lit on political prisoners, chats about the upcoming national prisoner work strike on August 19th, info on ecological organizing against the prison industrial complex and more! Starting at 9pm, there’ll be a benefit concert, bands to be announced. Check out http://brabc.blackblogs.org soon for details as they come. If you’re not in Asheville, keep an eye on http://june11.noblogs.org/events for things in your area to plug into. Don’t see anything near you, set something up and let the good folks at june11 organizing committee about it! An announcement from the Triangle IWW here in North Carolina: Alamance County Taking Back Alamance County, a neo-confederate hate group, is holding a rally at noon at the Alamance County Courthouse in Graham, NC. IWW has been working with Alamance County locals since November 2016 to keep this group out of the streets and public squares of *all* our communities. Thanks to the efforts of some of these amazing Alamance community members, ACTBAC has now been declared a hate group by the Southern Poverty Law Center.” The Triangle IWW is calling for people to join them on Saturday, May 20, as we rally to shut ACTBAC’s event down at 102 N. Maple St in Graham, NC at 11am. 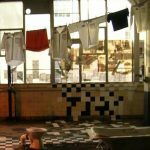 There is also a call for art and article submissions on Awakening Resistance for the 2018 Certain Days: Freedom for Political Prisoners Calendar. The Certain Days: Freedom for Political Prisoners Calendar collective is releasing its 17th calendar this coming fall. The theme for 2018 is ‘Awakening Resistance,’ reflecting on organizing in the current political climate. They are looking for 12 works of art and 12 short articles to feature in the calendar, which hangs in more than 2,500 homes, workplaces, prison cells, and community spaces around the world. Jaan Laman is currently serving a 53 year prison sentence for his role in the bombings of United States government buildings while a member of the United Freedom Front, an American leftist group which robbed banks, bombed buildings, and attacked law enforcement officers in the 1980s. Jaan K. Laaman is currently solitary confinement (“the hole”). Jaan has been in solitary confinement since his birthday on March 21, 2017 simply for issuing two political statements, a clear violation of free speech and human rights. The first statement was in support of the March 8th 2017 International Women’s Day and was in support of the Day Without A Woman Strike and was published by NYC Anarchist Black Cross. The second statement was his “Farewell Thoughts to My Friend, Lynn Stewart”, thoughts on the radical activist American leftist lawyer who died this year. The farewell thoughts were recorded by Jaan and broadcast via the Prison Radio project with Noelle Hanrahan. This is a special podcast release from The Final Straw Radio, airing weekly on WSFM-LP in Asheville, North Carolina and elsewhere. On June 1st, 2016, Jennette Shannon and members of Detroit Eviction Defense held a block party in a neighborhood of Detroit, Michigan. Jennette, a resident of this neighborhood for decades, and her teenage son have been in immediate danger of eviction due to legal wrangling and financial violence done by the vulture fund sometimes known as Thor Real Estate. Jennette has paid tens of thousands of dollars in fees to cover the company’s tax debts and to lawyers, has had her backyard parcelled and mortgaged by the company multiple times over and has been offered potentially fraudulent deeds and other paperwork. The block party was well attended by neighbors and activists from a plethora of community organizations from around Detroit to kick off the defiant struggle against eviction. 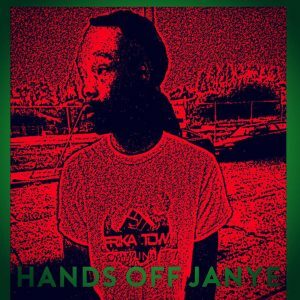 Today, June 2nd marks the beginning of that occupation, in which community members and folks from Detroit Eviction Defense are holding the space in solidarity. 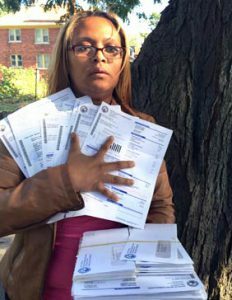 More on this house defense and the work of Detroit Eviction Defense can be found at http://detroitevictiondefense.org. Portions of this content will air in the episode of The Final Straw Radio for Sunday, June 5th, alongside part of an interview with Arianna Staiger, daughter of eco anarchist prisoner Marius Mason. In the interview, Arianna talks about her father, his incarceration, their relationship, about activism and shares some of her music. Do you feel insecure with your living situation? Rents always on the rise while wages stagnate? Getting priced out of your neighborhood? Want some ideas on how you might strike back and who against? 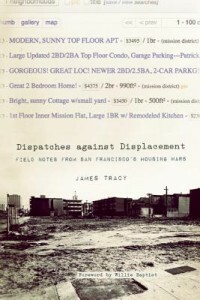 This week, Bursts spoke with James Tracy about gentrification and displacement in San Francisco and elsewhere. In his recent book, Dispatches Against Displacement maps some of James’ nearly 25 year struggles around housing rights in SF, mostly in The Mission District, as well as larger histories of the struggle to grow and sustain communities on commodified lands. James is a co-founder of the San Francisco Land Trust, former member of the Mission Anti-displacement Coalition and other groups. We discuss Dot-Com, Tech 2.0, Urban Renewal, Spatial Displacement and more.